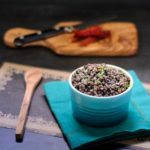 A recipe for black Beluga lentils with fresh herbs. Black lentils have a nutty flavor it and is complimented with fresh parsley, rosemary, and thyme. Sort through lentils to pick out any small stones or debris. Rinse lentils with cool water and drain. Add the onion and chili pod. Cook, stirring occasionally, until onions are softened and translucent. Add the garlic, thyme, salt, and pepper. Stir to combine and cook for 1 minute. Add the lentils and stir to coat with the oil. Cook for 2 minutes. Add the water and bring to a gentle boil. Reduce heat to low and simmer partially covered until lentils are tender, about 30 minutes. Drain lentils and transfer to a serving bowl. Remove and discard chili pod. Gently stir in the fresh herbs. Taste and adjust seasoning with additional salt and pepper if desired.